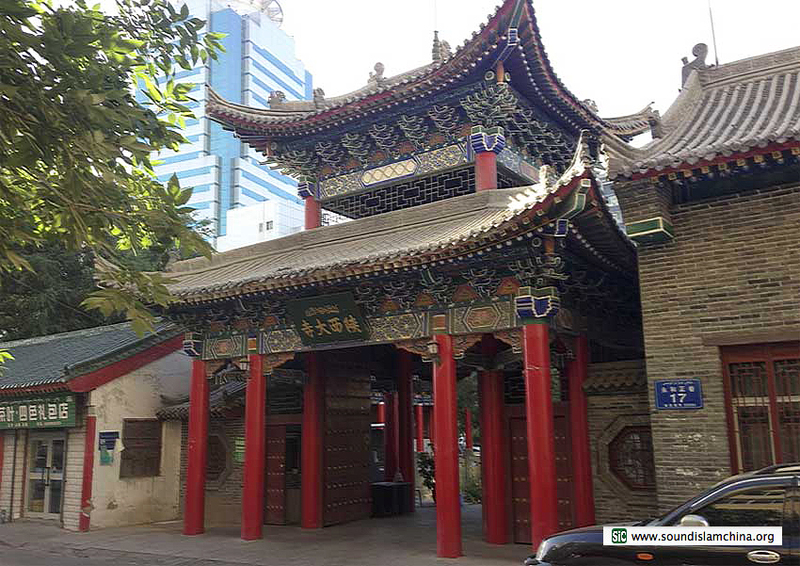 One of Urumchi’s largest and most influential Hui mosques, it dates from late Qing times and has also been the headquarters of the Urumchi Islamic Association. The Great Hall, with a magnificent ceiling height of ten meters, is bounded by red wooden pillars and backs on to a distinctive octagonal pavilion. With doctrinal prohibitions against the depiction of both idols and human or animal figures, the ornamental motifs consist mainly of carved fruit and plants. The extensive compound includes teaching rooms, canteen and bath house. Partially destroyed during the Cultural Revolution, the temple has been periodically reconstructed. As in most Chinese mosques, the list of donors and their respective contributions is prominently displayed near the entrance to the main prayer hall. Early evening prayers one Sunday evening during Ramadan consist of ritual Quranic recitation and chanting of zansheng (赞圣) by the Imams and by collected worshippers. Meanwhile, a young girl waits outside the prayer hall as her father attends.